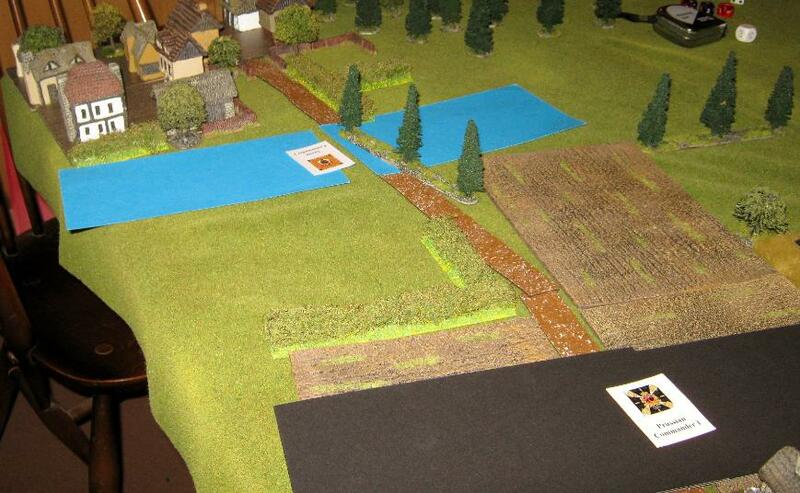 This scenario was adapted from the 'Black Powder' rules's 'The Fighting Retreat of El Perez' scenario, available from Warlord Games. period and the sort of thing that is usually very good fun. table. 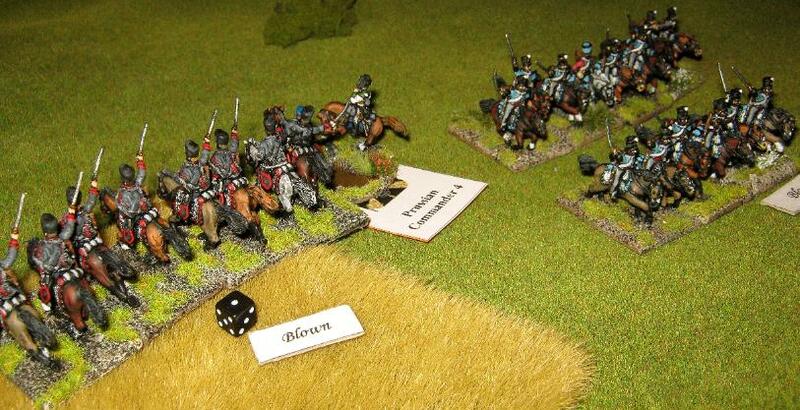 The Prussians needed to get 50% of their units off table to register a win. 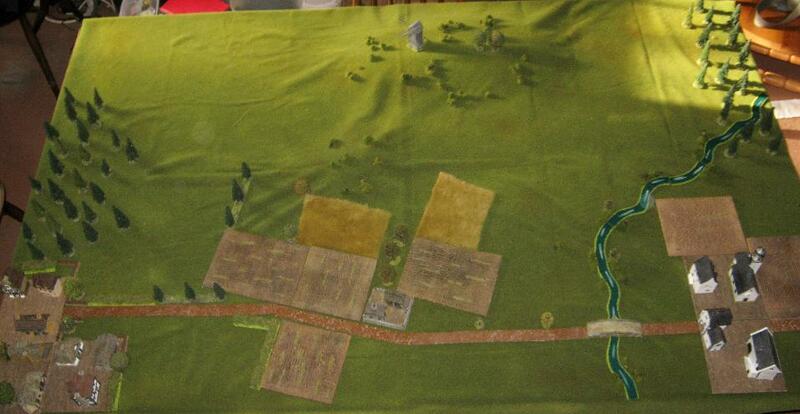 I took command of the Prussians with Paul T, faced by Nige as Saxon C-in-C ably assisted by Clive. more opportunity charges. It was looking decidedly dodgy for the Saxons. counting as disordered. He was bounced back. 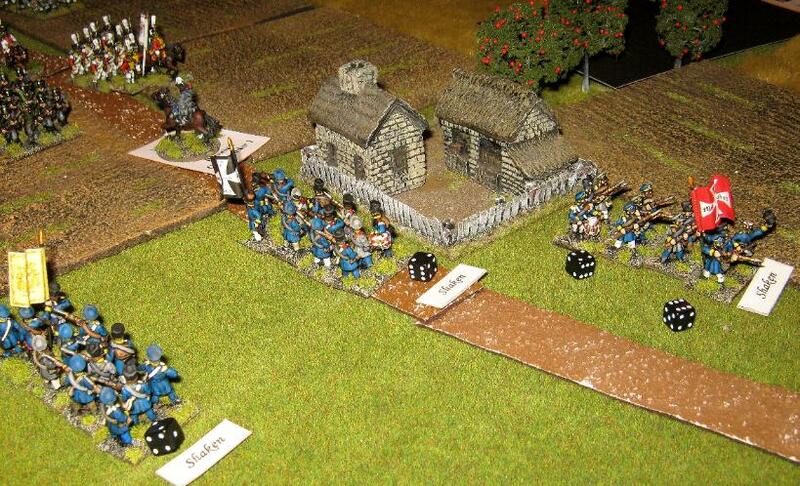 garrisoned by 'Brittle' troops. These too routed as a result of seeing their comrades rout. It was looking very good for the Prussians when Clive arrived. Doesn't he always. cavalry put up a good fight but were utterly routed and dispersed. 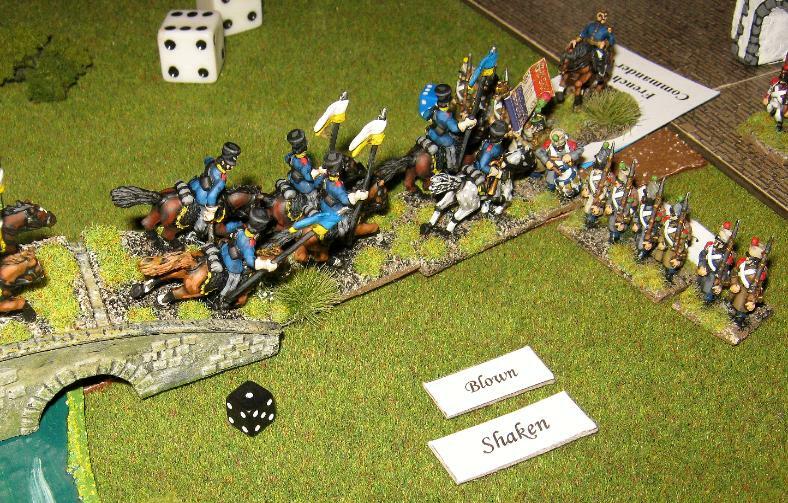 Even the return of the Prussian lancers did little more than shore up the exposed flank. cross the river at the bridge. 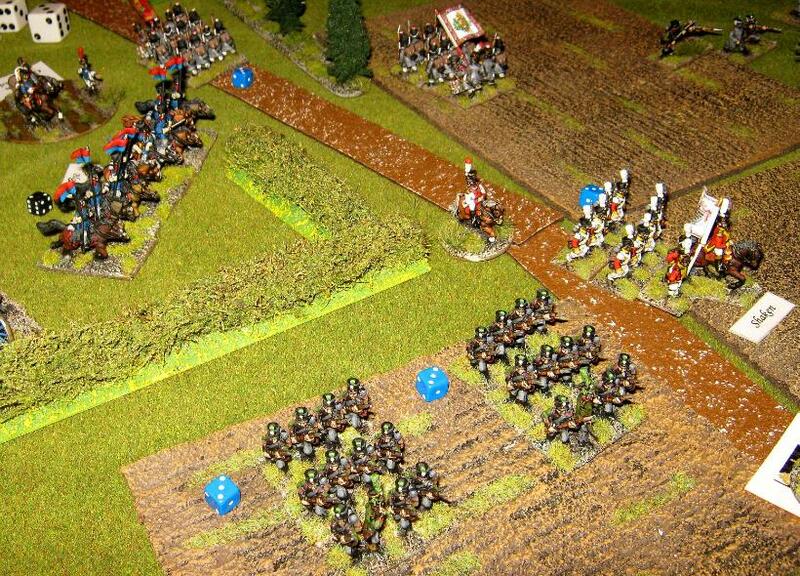 Utter chaos descended with the majority of the Prussians fleeing is total disorder chased by Saxon cavalry. 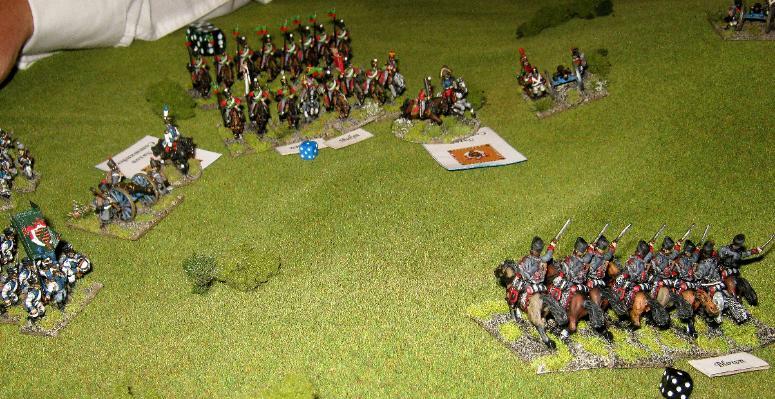 The Prussians managed to get six units out of the ten needed to win the day. A really fun game and a bit different. We all agreed that fighting retreats were a great idea for a scenario. Enjoy the pics. I wish there were more my batteries gave up the juice towards the end. 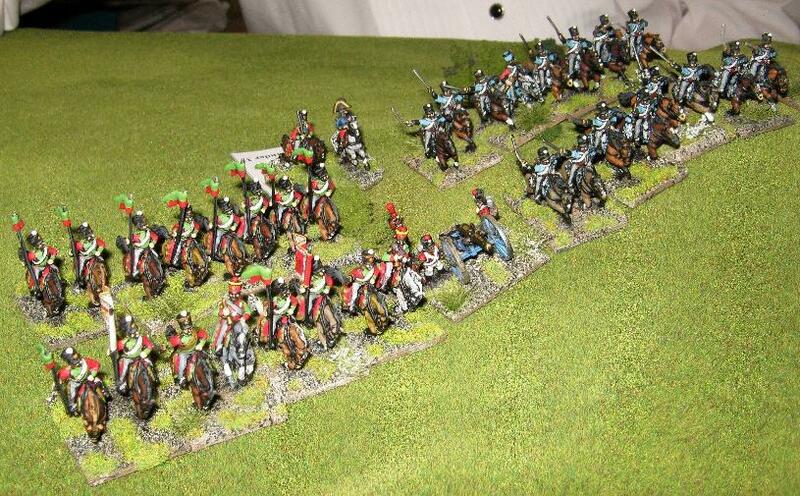 C-in-C on the low hill with a brigade of cavalry hidden behind. 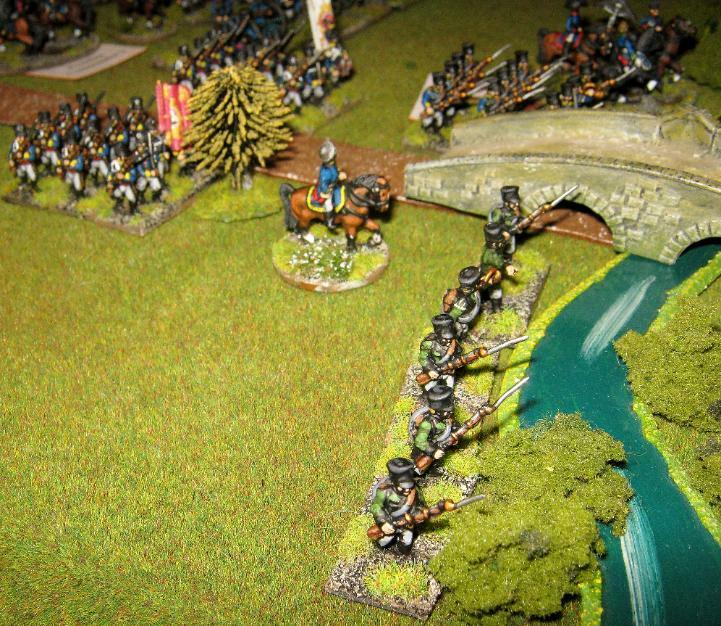 A detached brigade of four Landwehr battalions guards the road whilst a Prussian Infantry Brigade faces the bridge and Lardowitz. I had Nige write down in advance the entry points on his table edge of the Saxon blinds, before my blinds deployed. He was allowed a maximum of two blinds per turn to arrive and all units were on initial manoeuvre orders to march to Lardowitz. The Garrison Of Lardowitz Is Revealed. 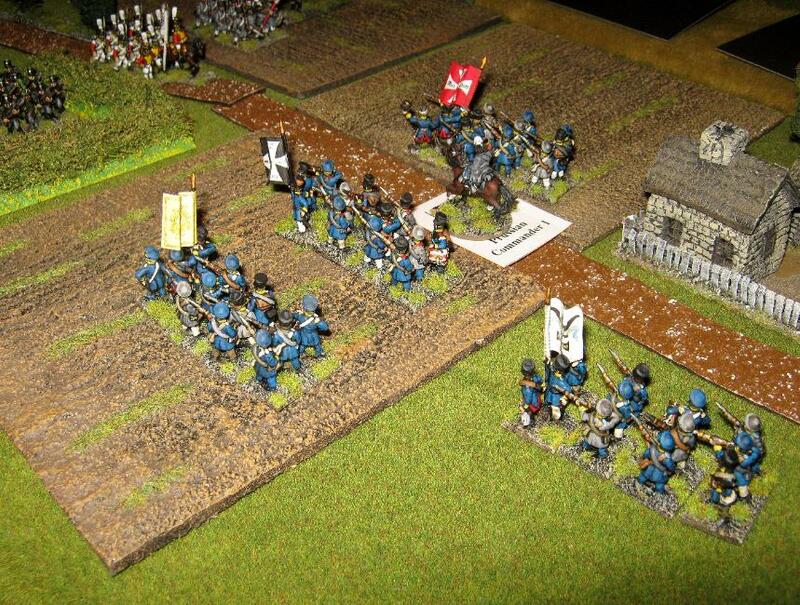 A French line battalion guarding the bridge and the Wurzburg Infantry Regiment occupying the village. 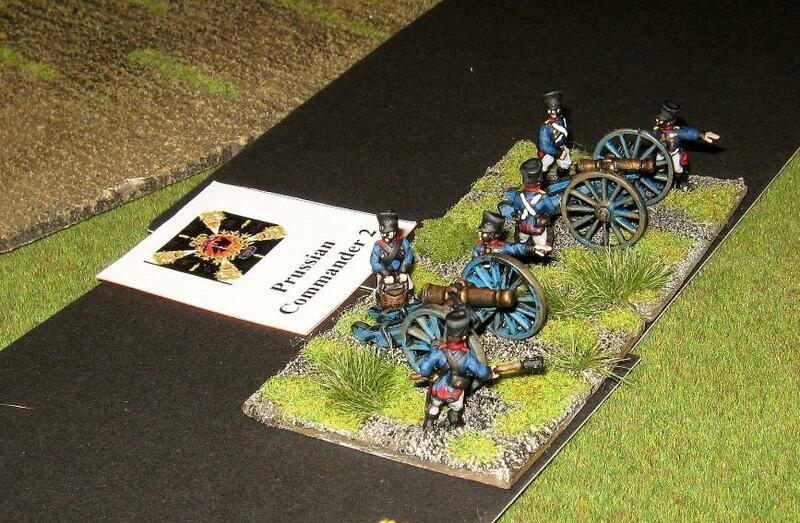 However Paul's artillery immediately shake the French and cause heavy casaulties on the enemy. Landwehr Brigade Guarding The Road. 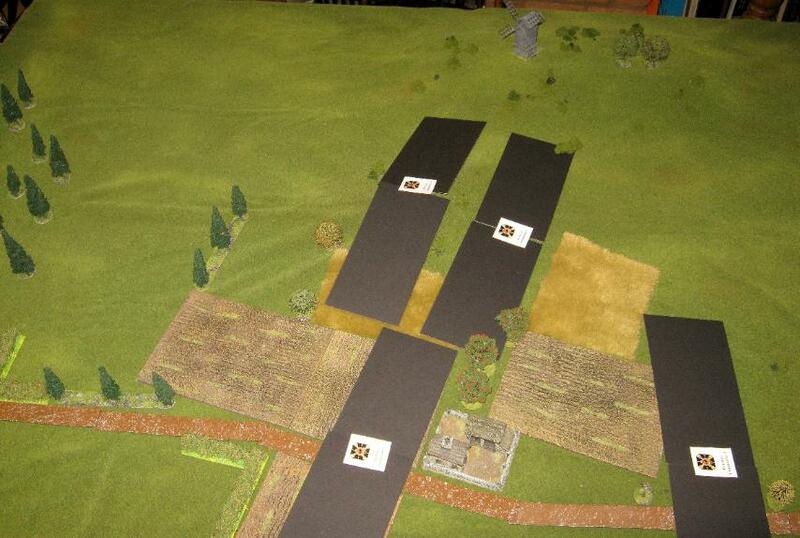 After appalling spotting the Saxons advance and close to automatic spot range forcing both sides to deploy. casualties on the enemy than received. 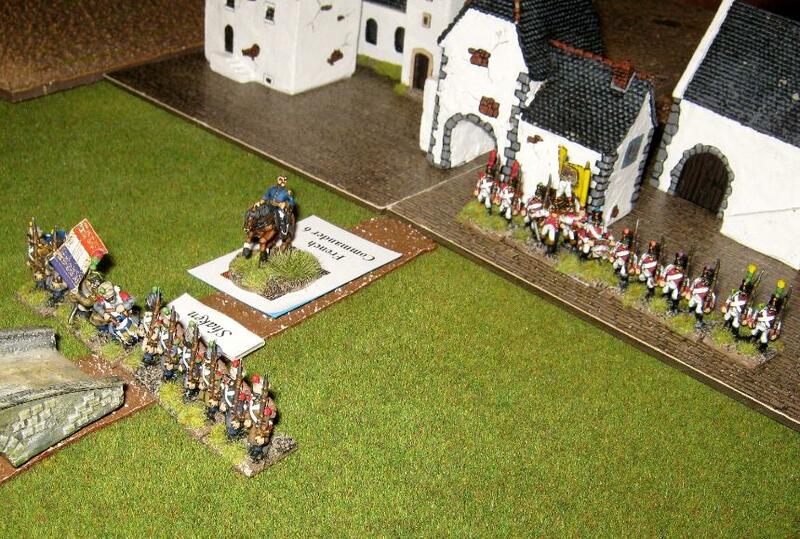 Being worse class than the Saxons the Landwehr were forced back Shaken. and are now threatening all movement with the threat of further opportunity charges. they have endured thus far due to firefights with the Landwehr. Doesn't he ruddy well always! Paul T's remarkably gutsy charge. 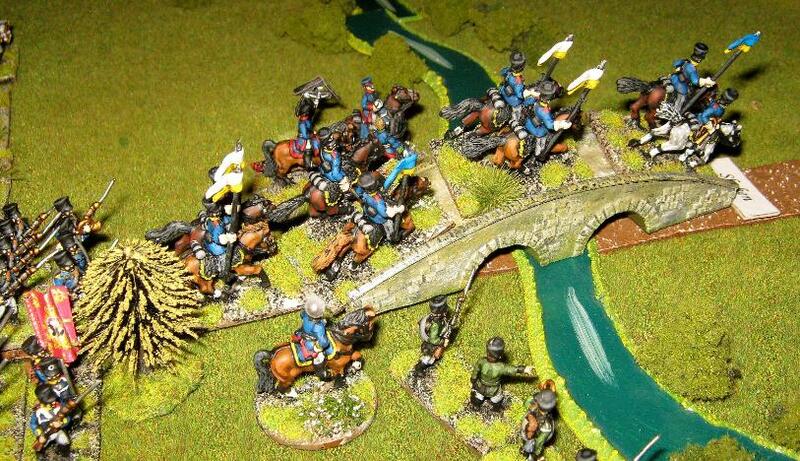 Blown Landwehr cavalry, disordered due to charging whilst in column of march V Shaken infantry. Paul rolls a double six. 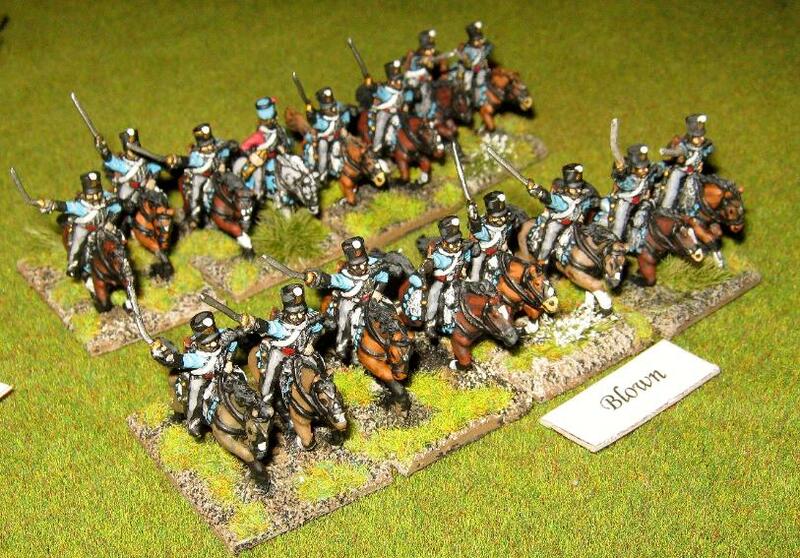 Prinz Clemens Uhlans supported by horse artillery. 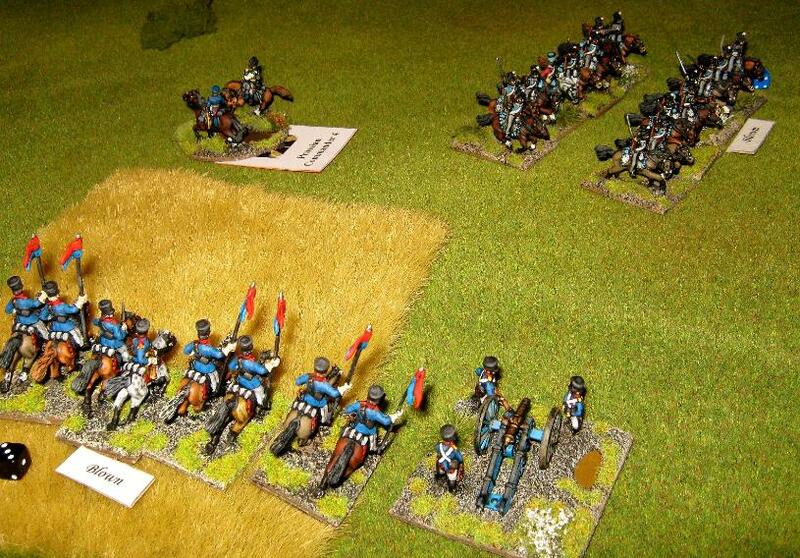 The Saxon Hussars rout the 2nd Silesian Hussars. 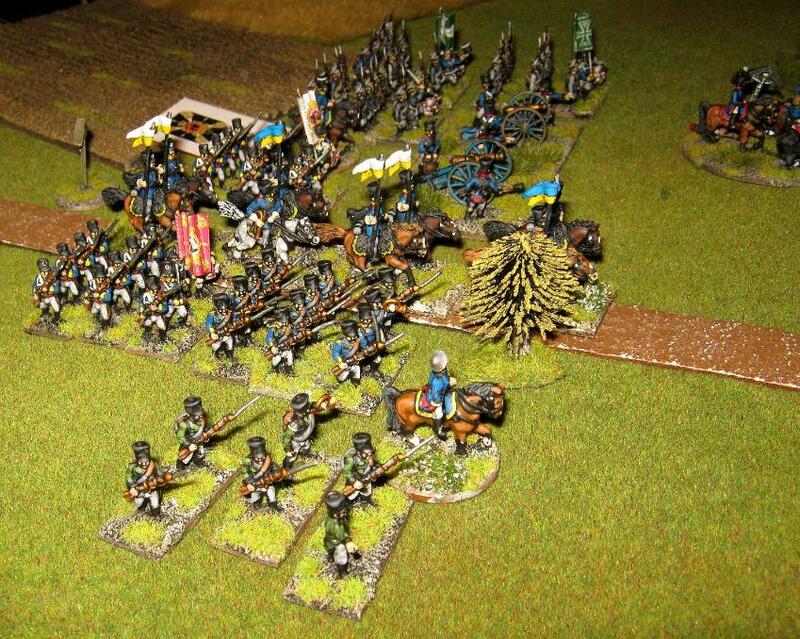 Fortunately the Prussian Uhlans arrive, with horse artillery in time to secure the flank. and the Prussian force was in chaos.